With a new month almost here, I need a new calendar page. You might have read last month that I am recycling my calendar from 2018. 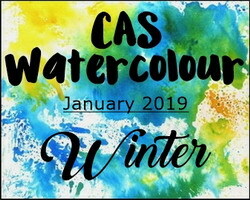 See January here. For February, I chose a sweet lil Hedgehog image from Penny Black. This stamp came to me from a blogging friend, Jean who was de-stashing. The Month word comes from Concord and 9th. The hedgie was colored with Copic markers. 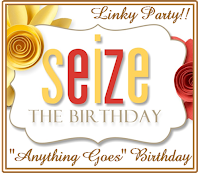 I am entering my page to the Penny Black Saturday Challenge where the prompt is Anything Goes. It seems a shame not to use a snowman for a January birthday, so I did. I had a good time playing with this MFT snowman set. 3 different images plus sentiments for winter, holiday, and birthday. Its a good set. Once more with this wintery flower arrangement. Colored pencils on gray cardstock were my choice this go round. This one is for my SIL. Its been a week of work for hubs and today I finally get to play! I need lots of birthday cards. My Stash is empty save for the one end of January card that will be mailed Monday. 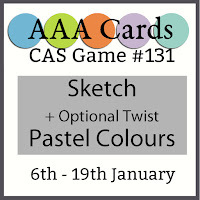 I'll be entering this card to four challenges - MFT Sketch Challenge, Color Throwdown, Seize the Birthday, (no toppings) and Casology. Looking at all these challenges a more masculine card came to mind, though I use polka dots and a scripty sentimnet. I'm considering that big scripty sentiment my circular element for MFT Sketches. 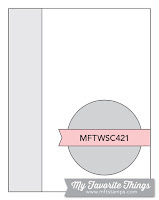 The stamp set is SMile from MFT. My inks is Hero Arts Navy. What do you think? Did I pull off a masculine feel, despite the polka dots and scripty sentiment? I'm on a roll with stock piling Christmas cards for 2019. This one makes #17. Almost 1/3 of my way done. I'm capping my handmade Christmas cards at 60 each year. Two years ago I made over 100 and it was just too much. So those of you (and I know of a few) who make them in the 100's and mail them---I am in awe. This weekend is the last time to get those 50 cent forever stamps in the US, the postage rate changes for one ounce letters from 50 cents to 55 cents on Sunday the 27th. I purchased a years worth of stamps a few weeks back so I am set for the year hopefully. 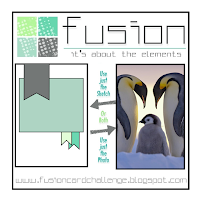 For inspiration, I looked to three challenges - Christmas Kickstart -Bundled up, Fusion-Penguin Love and for the design Case this sketch. The background was brushed on with distress inks in Tumbled Glass, Weathered Wood and Stormy Sky. The stamps are from Clearly Besotted, and were colored with Copics. I have a few stamps with birds on them, but I'm not really a fan of bird stamps...and as I say this I think about my bird stamps...I love my penguins, I love my seagulls, and I am kinda in love with the cute lil guys from Lawn Fawn...so I guess I am a fan of particular bird stamps...the ones that are easy to color. 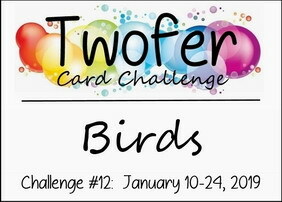 The challenge over at TWOFER is of course Birds. The deadline approaches and I had to play along. I've used my new Newton's Nook Winter Birds set. I love these guys cause I know how to color them all. I watch them all at the bird feeder outside. Both my cards are traditional cards. ETA:Okay....I've edited the post to clarify...I thought I wasn't a fan of bird STAMPS...the real ones I love to watch out my window. Well there are several challenges calling for flowers, so I am going to play along for a bit then it really is on to the Valentines. 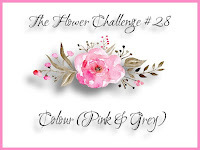 The card concept has a lovely mostly pink inspiration photo, cas on friday challenge is flowers, and the flower challenge has pink and gray. 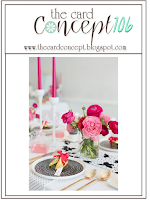 All the challenges contributed to inspiration for this clean and simple card. The flower and sentiment come from Altenew. The leaf outline is from SSS, and the faint dots come from MFT. The bloom was colored with copics. I must be in a blue phase or I'm just too lazy to get out any other colors...or maybe its my last gasp before all those reds and pinks for Valentines that are in my future. 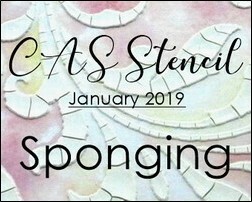 I'm playing at the new CAS - Stencil Challenge where the challenge is to use sponging with your stencil. I found a fun Clarity stencil with lots of bubbles on it and I liked that my first reaction to seeing it was a smile. Hope it brings the same reaction to my card recipient. I used my two favorite blues - Salty Ocean and Tumbled Glass to give gradient to my bubbles. One last polar bear before that set goes back into storage, until next winter. Or maybe fall he could become a black or brown bear too. I am having fun making cards today. I have one card for two challenges. 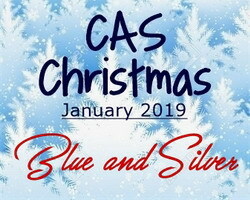 CAS Watercolor - Winter and CAS Christmas Card - Blue & Silver. The panel was watercolored with salty ocean and faded jeans distress inks, left to dry naturally. Then I added the image and sentiment from SU's Happy Seasons stamp set heat embossed in silver. A bit of silver glitter tape was used to frame the panel and finish off the card. Nothing but two loads of laundry left and a change of sheets. That means I will be spending the majority of my day upstairs in my crafty space. YAY. Its been a few days since I had time to sit and create in my space. So beware, several posts are likely today. I'm going with the sketch and the colors. A very simple card. I'm trying to play in challenges more consistently and to stop missing deadlines. I used to save the challenge links in a tool bar on my browser. I had to change the title of the link to get in the due date and sometimes I was just to lazy to do that. As a result I missed challenge deadlines. In December I tried a slightly different approach. 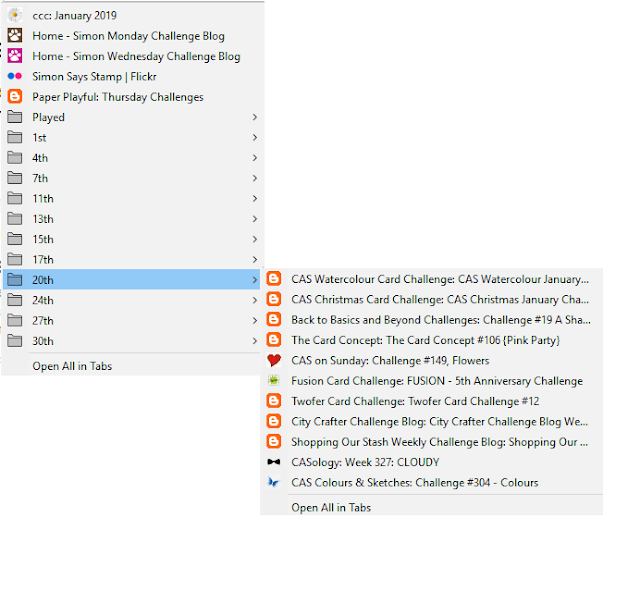 I added sub-folders to my toolbar Challenge folder. Each of the sub folders corresponds to a date in any given month. As I find challenges I am likely to want to play in, I drag that challenge and drop it into the appropriate date challenge. 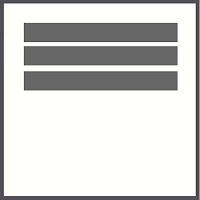 As I sit down to create, I just open the next closest challenge due date and with one click can open tabs for each challenge on my browser. (I use mozilla's firefox - and the option to open all is at the bottom of the list. In Edge, a right click will give the option to open all.) I have a few links at the top for challenges that don't really work in my date folders. I also have a "played" folder where I move the completed challenges to. Just incase I miss seeing the results on a busy day/week. I can go back and check on them. I am loving this new approach. How do you decide which challenges to play in or organize your DT duties? I had to play with the polar pals set from MFT. I love these guys, they remind me of the Coca Cola bears. I hope he has a lot of ice in front of him or hes gonna run into an iceberg. The snow storm really helped me to make some cards. I love the view out my window. 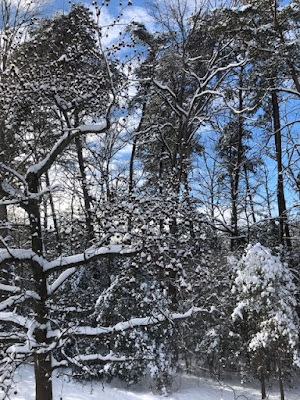 Be it the blue sky now that the clouds have gone or the busy bird feeder and all that wonderful snow. It has melted some but I would guess 8-10 inches fell over 36 hours. I got a few new dies recently and I took one out to play. Its from PTI a mix and match die that has an outer cut, and two dies inside that add cuts - but they can be cut apart and used separately or with other dies. I've left mine as is. Everything is perfectly spaced and I am not sure I'll be able to fit them together that well again. I added a triple stacked set of ice skates to the mat along with a SSS sentiment. I am submitting this to two challenges. 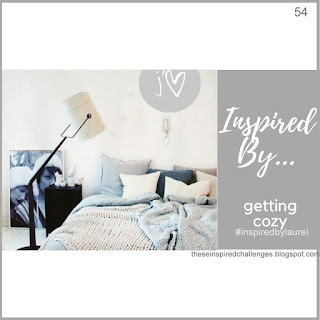 Inspired by (that white on gray wall hanging over the bed) and Cupcake Inspiration - Something New. We got about 8-10 inches of snow over the last two days and its lovely and white outside. 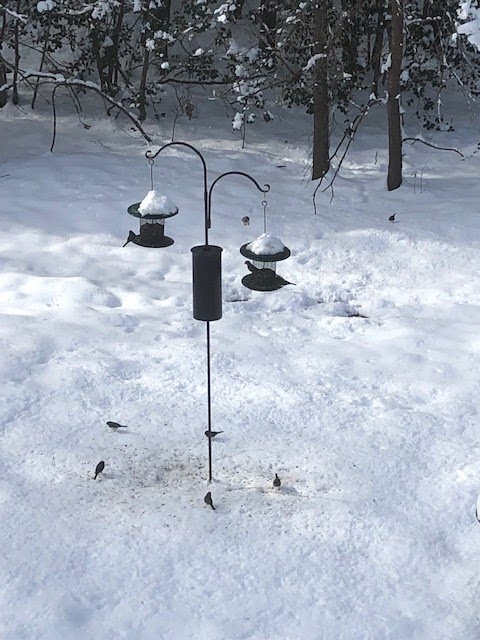 The birds are enjoying the feeder as the neighborhood cats don't like the snow, and aren't prowling about. Its a perfect view to make a few more wintery cards. The challenge at Addicted to CAS is Snowflake. The PTI die had a variety of snowflakes and we all know what happens when you gather them all up....snowmen! I might be pushing the CAS just a bit. Being retired, I have no daily commute so it's easy to be a fan of a day or two of snow. I am enjoying our recent snowfall and am making up a few last winter cards before I switch to the Valentines full time. My friend Peggy was destashing a few stamps and she let me have first pick at them. I have always wanted SU's Lovely as a Tree set. She was getting rid of it and I was happy to take it off her hands. 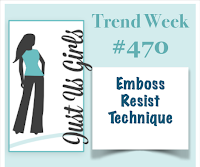 I've finally gotten it out to play with, courtesy of the Just Us Girls challenge - Emboss Resist technique. I heat embossed with white Hero Arts powder and then added Distress Inks in Black Soot, Faded Jeans, Broken China and Tumbled Glass with an ink blending sponge. I like the ombre effect these colors produce and it gives me a feeling of winter. After inking I used a microfiber cloth to take off any left over ink on the trees. The finished panel was attached to a black card base. Taking a break as it seems the Patriots have the game sewn up in the first half of the football game. I'll be glued to my seat for the second game today as "my team" the New Orleans Saints play. I'm still playing with the Bokeh Technique and tried a new color combination using Picked Raspberry, Candied Apple and Wilted Violet. Hero Arts Unicorn Pigment ink was used for the blur. My penguin is from Gerda Steiner and was colored using Copics. The frame was diecut with an MFT peek a boo die. My lil penguin was fussy cut. 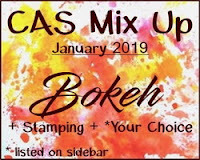 I am entering my third and last to CAS Mix Up Card Challenge, and a second card to Addicted to Stamps and more. Have a great Sunday. Thanks for stopping. We are expecting some snow this weekend, and I am looking forward to it. I have yet to have my snow pancakes. If I wake up to snow on the ground, I like to make pancakes. Since we visited Vermont last fall, I have real Vermont Maple Syrup for those pancakes. Hubs does not like a sweet breakfast so I rarely make pancakes. 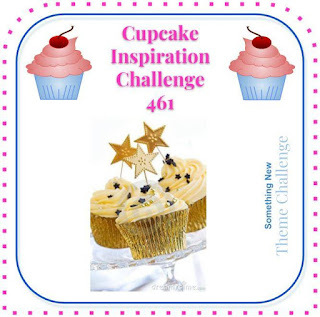 I looked to three challenges for inspiration today. Frozen is the cue word over at Casology and CAS Mix it up has bokeh, Stamping plus my choice ( I colored and diecut.) The CAS group has a new challenge - Stencil the prompt is sponging. I already entered at CAS Mix it up, but I used Bokeh patterned paper previously. This time I made my own Bokeh backdrop roughly blending Distress Oxide inks in faded jeans, broken china, peacock feathers, salty ocean on a panel; then used a fingertip sponge dauber with Hero Arts Unicorn Pigment Ink to make my bokeh blurs through a stencil with varying sizes of circles. I was intrigued by the sketch at Freshly Made Sketches and a holiday cards was called for at Addicted to Stamps and More. Its taken me til today to catch up on chores and groceries around here. I finally got a chance to sit down and make a card. This one is for two challenges - Shopping Our Stash -Winter Blues, and Simon Says Stamp Monday Challenge Use Something New. The Snowflake die is a new stash piece that hadn't cut anything yet. Hi there - Another card for my 2019 Christmas Card stash. 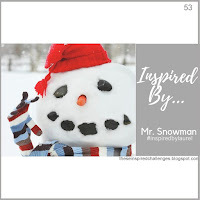 This was inspired by Inspired by - that bold red on the snowman's cap really caught my attention. I decided my light wrapped and ear muffed snowman would do nicely for another entry to this fun challenge. I had fun at Peggy's place last week, and got 7 cardfronts colored. Last night I finshed them up and made them into cards. The challenge at CAS Mix UP is Bokeh + Stamping + one other technique. I used some die cutting on the edge of my card. 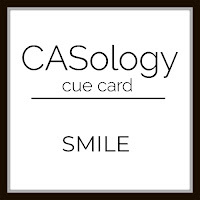 After stamping and coloring my card front, I used a curved scalloped die to cut the bottom edge. I used a patterned paper that has a bokeh look to it under that scalloped edge. The second card I am showing also has that bokeh paper and a touch of sponging off of a hill stencil to give the sled a place to run. I'm going to give that bokeh technique a try and post that later on.